Timeless, classic solitaire engagement ring with a yellow gold band and six prong setting, all designed to make your center diamond look great. This ring can be set with a round, marquise, or pear shaped diamond. Yellow gold engagement ring with a split shank and pave diamonds all around. This setting has a vintage feel to it with intricate detailing throughout. Set this ring with a round diamond of your choice in the center. Handmade six-prong solitaire engagement ring. This ring is classy but will still turn heads. The band on this 18k yellow gold solitaire engagement ring tapers in as it nears the center diamond, emphasizing and visually enlarging your center stone to make it appear even bigger. This ring can be set with a round or oval shaped diamond. 6 channel-set pave diamonds, the center diamond of your choice, and a cathedral setting makes for an eye-catching ring! Small, micropave diamonds provide sparkle and contrast against the 18k yellow gold band. This setting is relatively thin -- good if you want to make your center diamond look slightly bigger. You can choose just about any diamond over .5 carats to set in this ring. This ring has a very interesting twist -- an open, twisting latticework pattern around almost the entire 18k yellow gold band. I don't think this ring is for everyone, but many people will absolutely love it. I find it very refreshing and unique as I can't remember ever seeing many other rings like it. Oh, and it also has small micro pave diamonds along the band. This is a thinner band at 2.0 mm wide, sure to make any diamond pop! The small pave diamonds are just enough to add extra flair and sparkle without taking away from the splendor of your center diamond in this beautiful 18k yellow gold engagement ring. 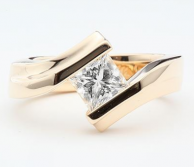 The "tulip style" band also arches up as it holds your main stone secure, which can be a round or princess cut diamond. 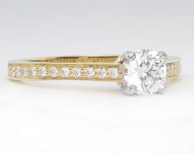 This is a simple, classy solitaire yellow gold engagement ring. The band is on the thinner side, and the center diamond is secured with a double-prong platinum setting. This ring can be set with any shape or size diamond. This extraordinary designer engagement ring contains a halo setting surrounding your center diamond, pave diamonds decorating the shank on all three outer sides, beautiful milgrain detailing on the 18k gold yellow band, and even surprise diamonds on the basket holding your center stone. This ring is meant to be set with a cushion cut diamond but can also be set with a traditional round diamond (we prefer the cushion cut for this ring though!). Contemporary style solitaire engagement ring. Stunning solitaire engagement ring with a bar setting to make your center diamond look like it's floating in mid-air. This graceful ring can be set with a round diamond in the .5 to 1.49 carat range. 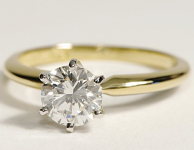 Simple, elegant yellow gold engagement ring. This setting has six prongs around the center diamond for added durability, and the band pinches slightly at it reaches the top. 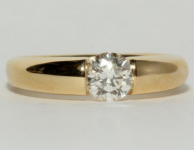 Beautiful yellow gold setting, just add 3 diamonds! Two princess cut sidestones and 8 additional channel set diamonds give this amazing engagement ring its flair. 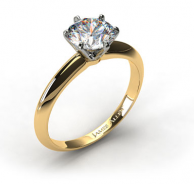 The 14k yellow gold setting can be set with any shape diamond. Beautiful contemporary setting that will take your breath away with its dramatic setting of your diamond. The yellow gold band will stand out from all the other white gold and platinum settings and provide contrast to the diamond. 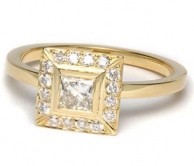 Shown with a princess cut diamond, but also can be set with a round, oval, or emerald cut diamond. I don't really have to say much about this ring -- look at the picture above! Ritani decided to fancy up the band with TWO rows of French-set, pave diamonds, giving this ring tons of personality (the best kind of personality too -- the kind that sparkles!). Of course, I haven't even gotten to the center diamond, which I'm sure you will choose brilliantly (get it?)! 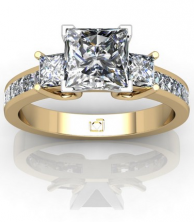 You can put a round, princess, cushion, Asscher, oval, or emerald cut diamond in the center.